Ivanovic suspended pending ENT clearance for left ear. Holloway wins unanimous decision in five rounds 49-46, 49-46 and 48-47 Sinclair. Holloway suspended 30 days for right lateral eyebrow laceration. Brattole wins via TKO referee stoppage at 0:56 of round two. Davis suspended 30 days for TKO. Davis suspended indefinite pending CT head scan. Felix wins unanimous decision in five rounds, 50-45, 50-45 and 50-43 Sinclair. Cho suspended 30 days for rest period. Cho suspended indefinite pending CT head scan. Fung wins unanimous decision in three rounds 30-27, 30-27 and 30-26 Colon. Odria suspended 30 days for rest period. Gegovich wins unanimous decision in three rounds, 30-27, 30-27 and 29-28 Colon. Donguitus wins unanimous decision in three rounds, all three judges 29-28. Sosa wins split decision in three rounds, 29-28, 29-28 and 28-29 Colon. Silva wins split decision in three rounds 29-28, 29-28 and 28-29 Smith. Green wins split decision in three rounds 30-27, 30-27 and 28-29 Sinclair. DeBlasi suspended 30 days for rest period. Dahm wins unanimous decision in three rounds, all three judges 30-27. Magliacane suspended 365 days for refusal of post fight medical treatment. Cintron wins unanimous decision in three rounds, 29-28, 29-28 and 29-27 Smith. 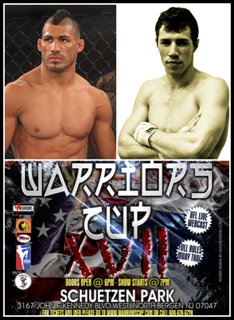 This entry was posted in News & Results and tagged featured, Muay Thai, NJACB, warriors cup results. Bookmark the permalink.